Anita Jo Intenzo-Haunted Author: WHERE SPIRITS ENERGIZED BY OUR TV SHOW? WHERE SPIRITS ENERGIZED BY OUR TV SHOW? I have mentioned in 2 earlier blogs that reports from witnesses and paranormal investigators that indicate spirits can make sounds: footsteps, screams, bangs, tapping sounds, etc. and in most rare cases, spirits known as poltergeists can move or break objects. Yes, I have witnessed this first hand and written about it. 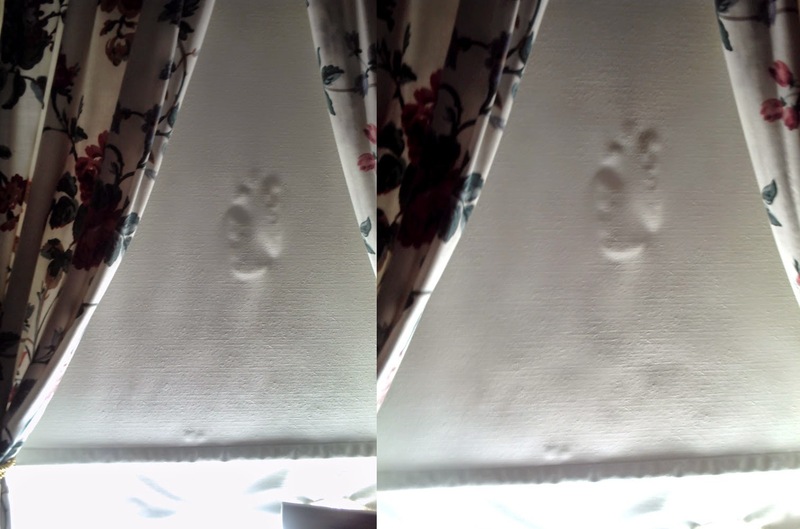 However there is other unique physical evidence, that I'd like to update here on this newest post, our continued unexplained hand prints and fingerprints on different surfaces. Can a ghost or entity leave a visible hand print/fingerprint? Have you seen a footprint or a hand print on a window, glass table, or car where an entity could be responsible for the imprint? One theory is: we know from investigations that spirits cause temperature changes, (watch any ghost hunting show and they are using sensitive meters that can detect environmental changes during an investigation) and in doing so can the change in temperature around one's hand, in theory, discolor or fog up something that was sensitive to temperature (like glass). Then, all it would take is some dust or something to stick to the fog and you have a ghostly hand print. So.If ghosts can manifest some kind of semi-solid matter and manipulate temperature changes- can they do this to leave imprints? That’s one interesting theory. 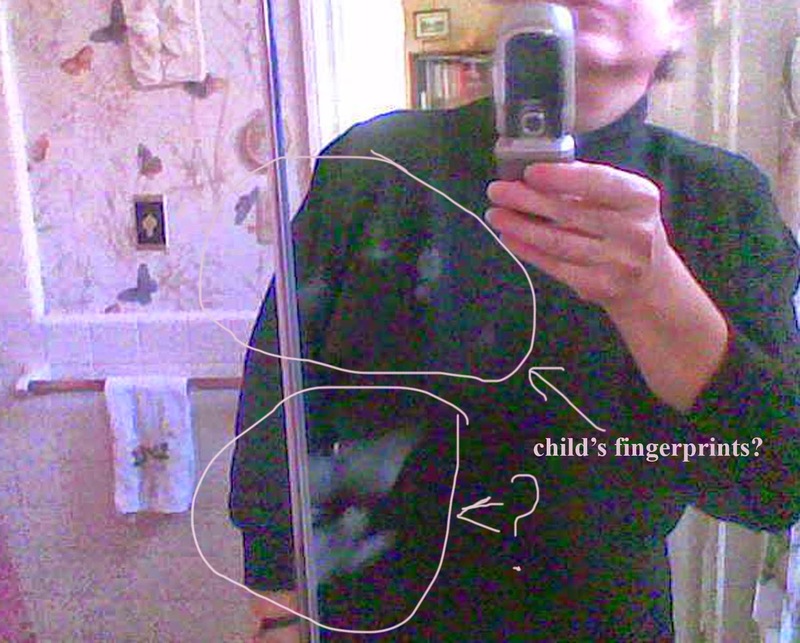 I first noticed a weird looking finger print on our downstairs bathroom mirror several years ago in 2010. At the time I was writing my book Estate of Horror and we were experiencing paranormal occurrences in our house. At the same time, my son was experiencing very vivid and horrific dreams of recently deceased people visiting him at night during that summer. His experiences as a psychic medium will be further explored in the sequel, Dark Transference that I am currently writing. 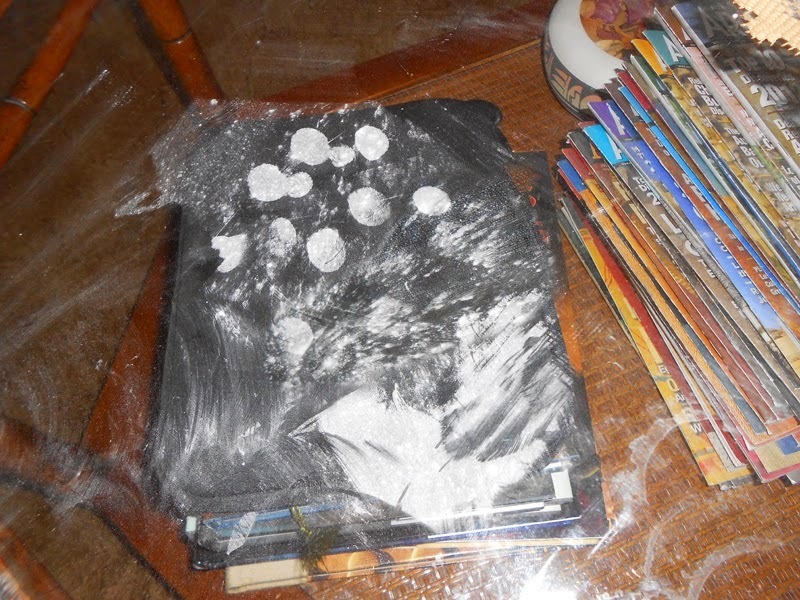 In February 2013 unexplained hand-prints appeared on our glass coffee table in the living room. (I had seen something like this before but only thought them our prints and wiped them off with Windex). After putting baby powder over them we were able to get a good image with our digital camera. We then saw that there were not 2 sets of prints but another smaller set over them! Possibly a child’s? We also can see actual ridges of the fingerprints in several of the marks. 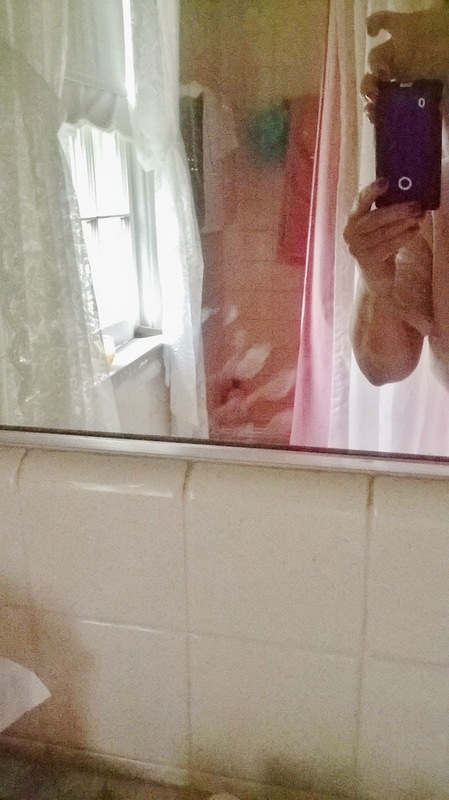 We photographed and documented them and then erased them from the surfaces. We had Bill Bean over to our house and his prayers and deliverance session seemed to erase much of the negative energy we were experiencing. We heard distinct physical movement: squeaks, pings and bangs as Bill did his demonic confrontation with sacred prayers. He told us he was clearing house and it we heard "them" leave! We were so happy to feel we had finally got rid of these unwanted entities. 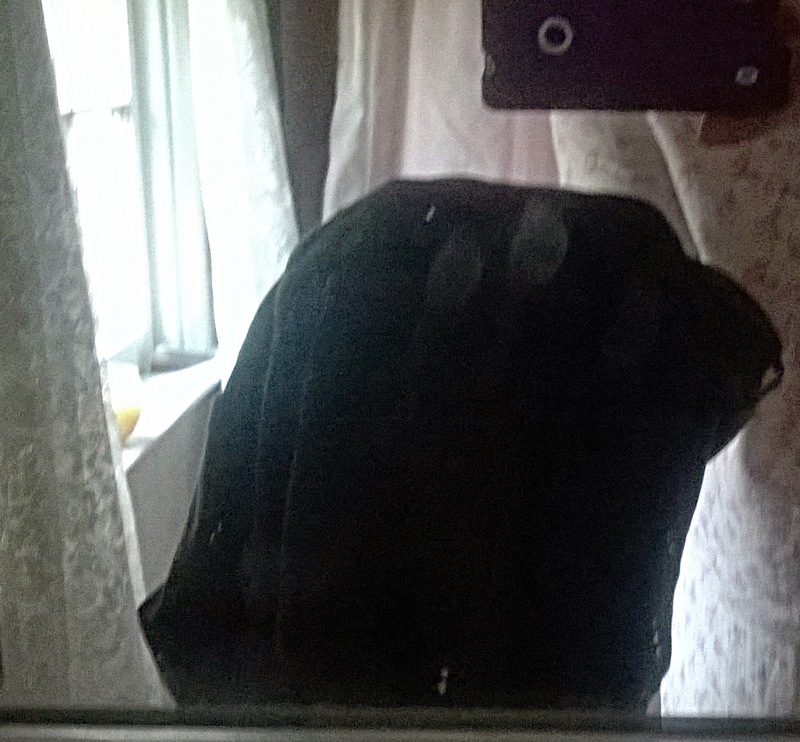 Late May 2013 I noticed an odd shape on the vinyl window shade in my bedroom. Directly in the middle of the white shade was an embossed print of something that looked like an elongated hand-print and 2 separate finger imprints near the bottom of the shade. It was impressed from the outside in against the window! It looked like it was done with heat that actually melted the vinyl to stretch the hand print and finger prints out. It’s permanent on the shade. Months went by and nothing else showed up on any surfaces. 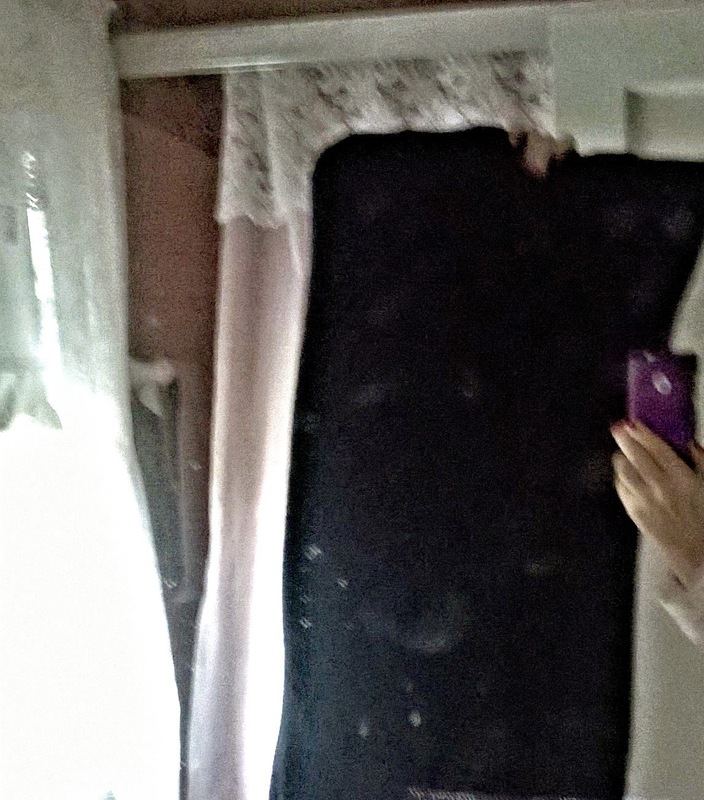 I went into the upstairs bathroom and something on the mirror caught my attention. It wasn't a reflection or my imagination. There they were at the bottom of the mirror. More inhuman looking fingerprints! They looked very similar to the prints in the downstairs bathroom mirror from almost 2 years ago. It correlates with strange things happening again while I've started to write the sequel to my book. We again called Bill Bean and he was very concerned with the ghostly threats since directed at me for revealing the horrific family secret in my book and the resulting research and conformation of evidence I've received that is shocking. He once again came to our house in September 2014 and was here all day doing an all out assault on the dark forces that stubbornly refuse to leave for good. Peace once again filled my house. 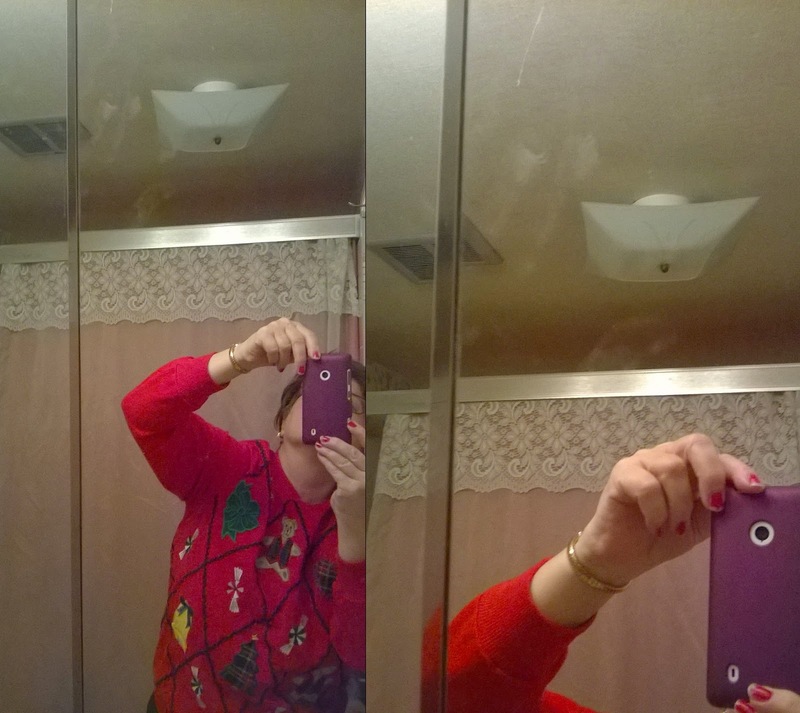 Then December 24th 2014 these hand and finger prints appeared on my upstairs bathroom mirror in the upper right panel of my 3 part paneled mirror. Ironically this was exactly 5 years to the day, the haunting started in my house after selling Paul's house in Oct. 2009 and our paranormal lives began. Notice how the prints seems to be overlapped with another elongated set of print above them.Or is it that these prints are dragged downward? 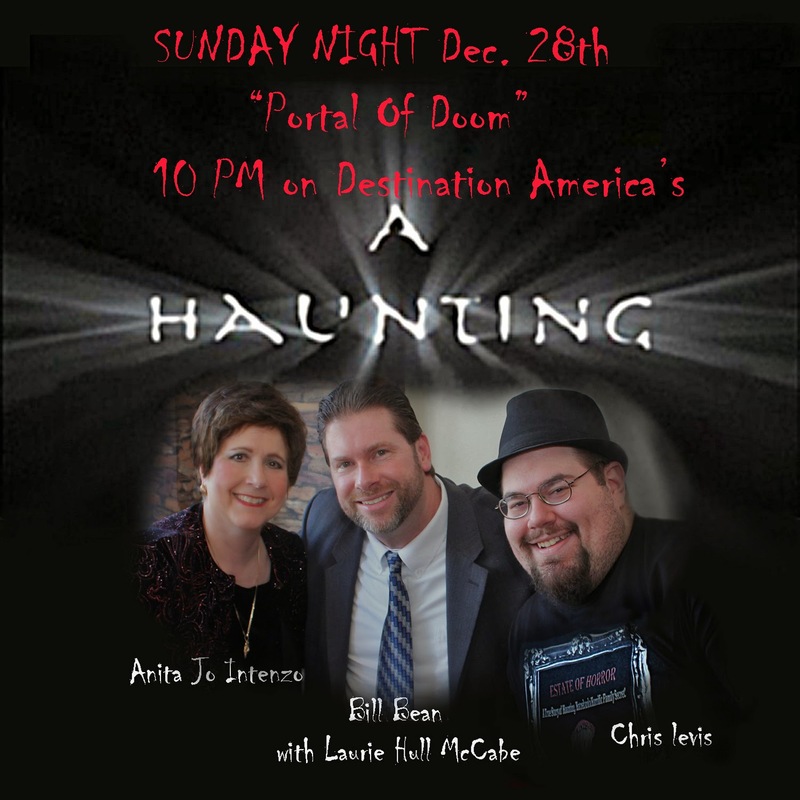 Sunday, December 28th, The national airing of our episode on Destination America's A Haunting TV show called "Portal of Doom". Here is the youtube link if you missed the episode. In the early morning hours (2 AM) after the show aired I awoke and heard noises in my hallway and outside the bathroom. I felt unsettled and uneasy but the noises stopped and I fell back to sleep. 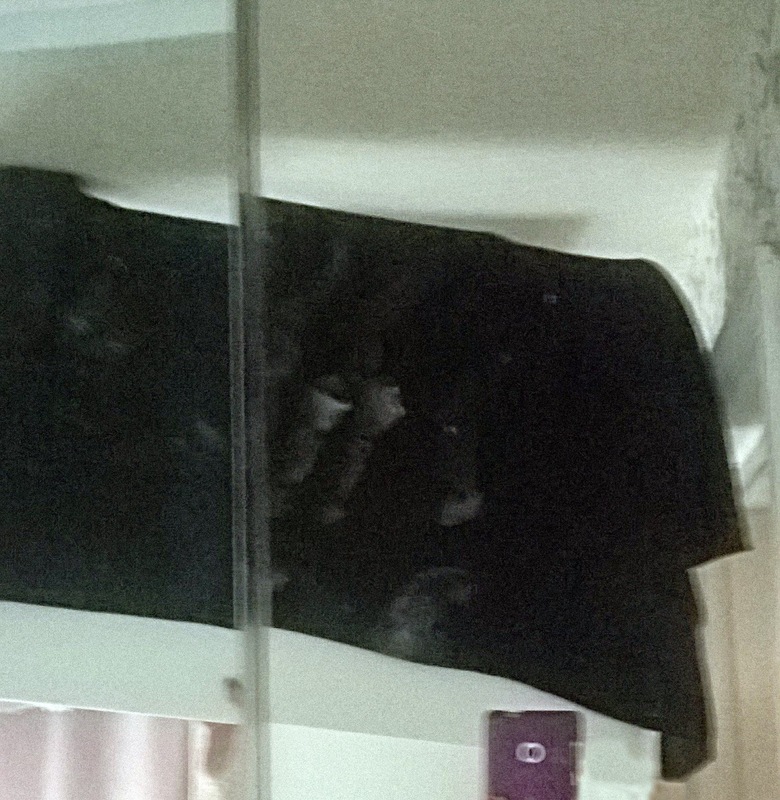 The next morning here is what I found on my bathroom mirror: 3 more sets of hand and fingerprints. Another view off side to get the images. So there you have it, a continued line of ghostly manifestations in forms of hand and finger prints. Did the airing of our show somehow energize the atmosphere for the spirits to manifest once again? Possible. 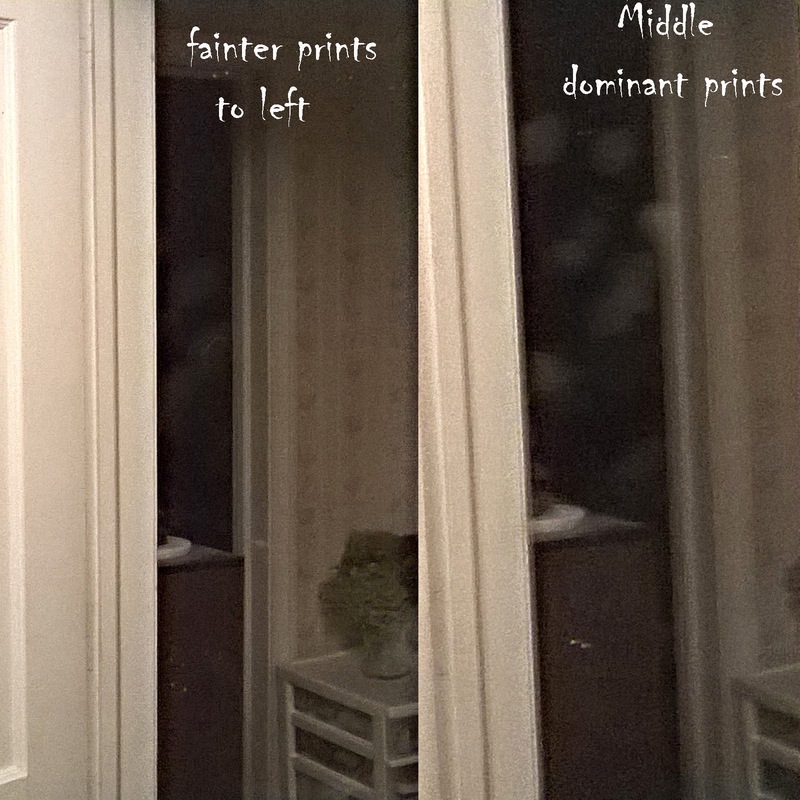 We are convinced there is a portal or area of spirit activity, in the upstairs bathroom, that opens from time to time. 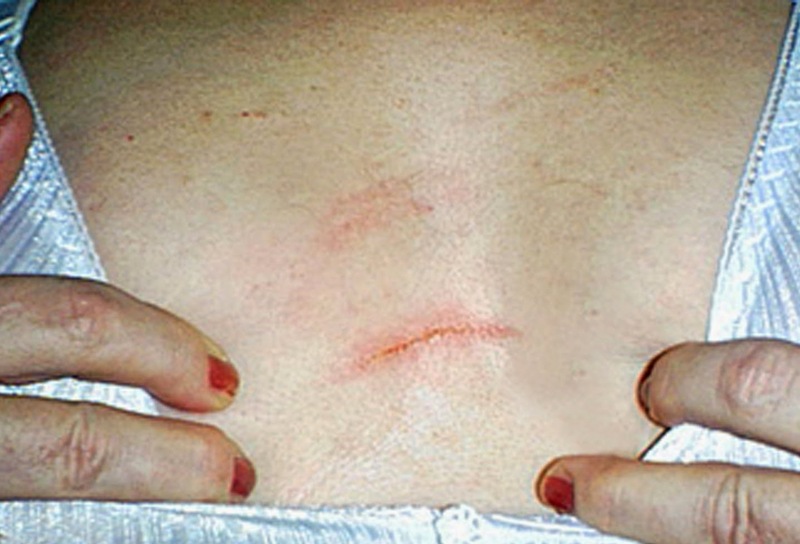 Those of you who saw the episode on A Haunting know that is where I was scratched across the chest in a vicious manner. Is this aimed to frighten and deter me from writing the sequel? This is not the only thing that has been happening here lately. I intend to reveal new horrific discoveries in my upcoming sequel. Yea, like I said, I am truly a "haunted author" but I am not backing down!